Benchmade offers two sharpeners by Redi-Edge that are small enough to sit unnoticed on a keychain or tether around your neck. Both have a 60-degree inclusive angle (often referred to as a 30-degree angle) that will easily touch up the edge of your blade anywhere, anytime without removing unnecessary blade material. 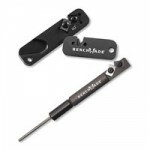 The larger sharpener also has an area for honing as well as a V-notch to sharpen fishhooks or anything small and pointy. MSRP $25.